Fishing picked up this morning for a few of our guests fishing in 14 feet of water just off the resort. Single egg with a small piece of worm worked very good for one fellow. One fish he had on the line, broke as he tried to get it out of the 6″ hole. Others picked up a couple fish using shrimp and or worms below a flasher used to get the fishes attention. 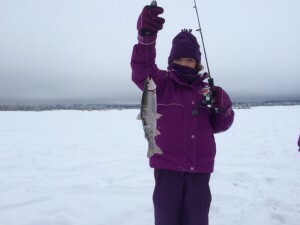 Overcast weather with lows to -7 and highs to -3 during the day without any wind which made fishing enjoyable. There’s about 5-6 inches of snow on the lake ice with some spots with a bit of water on the ice. Forecast is more of the same but a couple degrees warmer mid week with a slight chance of snow Wednesday.